When mentioning “the four seasons”, one may be tempted to immediately think of Antonio Vivaldi. However, il Prete Rosso was not the only composer to draw inspiration from this theme: F.J. Haydn wrote the oratorio Die Jahreszeiten and Pyotr Ilyich Tchaikovsky composed the piano pieces Les Saisons. 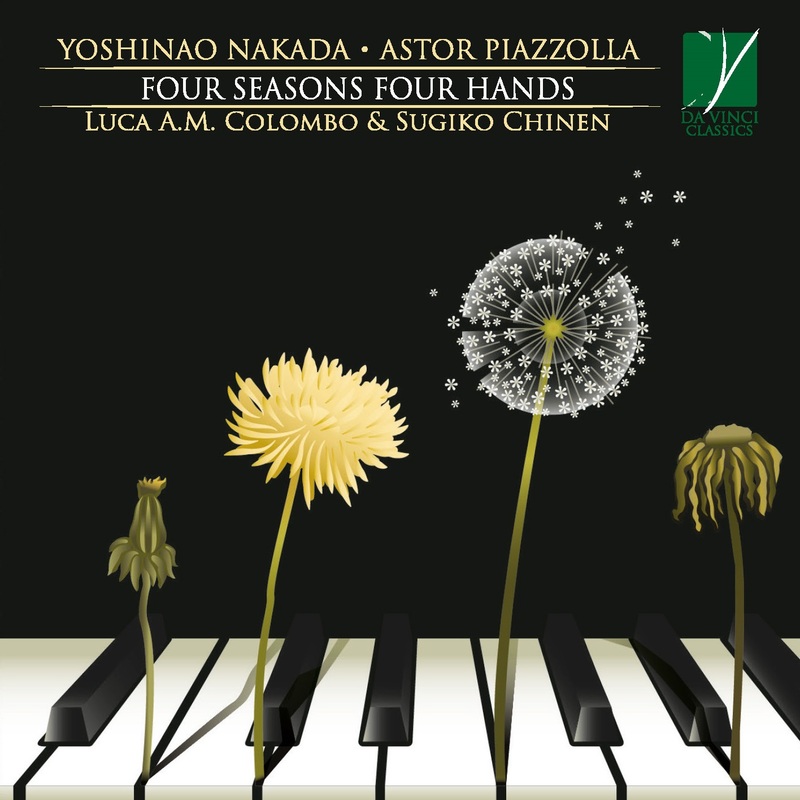 Instead, this recording deals with “The Seasons” by two 20th century composers, the Japanese Yoshinao Nakada and the Argentinian Astor Piazzolla. The profound differences between these two artists are not limited to their countries of origin: in fact, while Nakada put particular emphasis on the delicate and suggestive musical nuances, Piazzolla was moved by stark contradictions and strong emotions; while the former was characterised by melodic compositions, the latter was inspired by powerful and enthralling rhythms. However, upon closer inspection Nakada and Piazzolla did have something in common. First of all, they lived during the same time, being born only 2 years apart and having died within 8 years one from another. Secondly, they both had tight connections to their respective cultural backgrounds, namely the folk songs and the link with Nature for Nakada, and the Tango, with its social and emotional implications that strongly influenced Piazzolla. Finally, both Nakada and Piazzolla shared an eclectic composition technique stemming from their knowledge of classic and contemporary composers, through which they effectively reveal the most intimate nature of their musical universe. Luca Arnaldo Maria Colombo e Sugiko Chinen started performing as a piano duet in 1995 in Milan. Since then, they have given recitals across many European coun-tries, including Italy, France, Spain, Austria, Poland, Norway and Czech Republic, as well as in Japan, taking part to numerous international festivals and events. Deeply influenced by cultural backgrounds as different as Italy and Japan, they have developed a unique artistic sensitivity in their four-hand piano performances that have been acclaimed by the critics and the public likewise. Through a rigorous and meticoulous study of the musi-cal score, Luca and Sugiko have achieved a profound un-derstanding of the music that results in a singing sound, in a novel but rigorous phrasing and in a wide range of sonorities, from the delicate “pianissimo” to orchestral “fortissimo”. This richness of timbre, the elegant musical phrasing and the delicate nuances represent the most distinctive features of their appreciated pianistic style. After devoting themselves to performing 19th and 20th century Italian and French four hands piano scores, Luca and Sugiko have extended their repertoire to include the Viennese Classicism (Mozart, Schubert Czerny ), the North European Romanticism (Schumann and Grieg) and the great composers of the second half of the 20th century ( Poulenc, Rota, Nakada and Piazzolla ), focusing on the greatest masterpieces of each of the above com-posers to achieve the best interpretative results. Nakada, Yoshinao (b Tokyo, 1 Aug 1923 - 2000). Japanese composer. Son of an organist, he began to play the piano and to compose in his boyhood. He studied the piano with Nobori Kaneko and later with Noboru Toyomasu at the Tokyo Music School (1940–43). After a short period in the army at the end of World War II he became active as a composer, joining the group Shinsei Kai in 1946. In 1948 he made his début as a pianist, playing his own pieces, and in 1949 his Piano Sonata won second prize at the National Music Competition. A period of concentration on piano music and songs was followed by an extensive output of choral works, children’s songs and incidental scores for radio and television. His music follows the tradition of the Romantic lied and mélodie, making no use of later developments. The lyricism of his songs and his successful handling in them of Japanese texts have brought them great popularity within Japan. A director of the JASRAC (the Japanese performing rights society), he was also a professor at Ferris Women’s College, Yokohama (1964–93), and has published Jitsuyō wasei gaku (‘Keyboard harmony’, Tokyo, 1957).